My Easter Lent adventure is coming to an end this Sunday; it’s been both hard and not a big deal and I’ve been kind of a good sport about my (almost) vegan diet in the last 50 days or so. There has been moaning, even despair at times (I have a flair for the dramatic more than I care to admit). Mostly there’s been a lot of delicious favourites and experimentation too featuring the following: pulses, tahini, fresh and cooked veggies, nuts and a fair amount of prawns. While I normally eat lots of fish, in the absence of it, I rediscovered how much I love seafood: I devoured this pasta a couple times and made delicious steamed mussels with lots of garlic and a hearty side of toasted bread; yet, the dish I enjoyed the most during this period are these tacos. 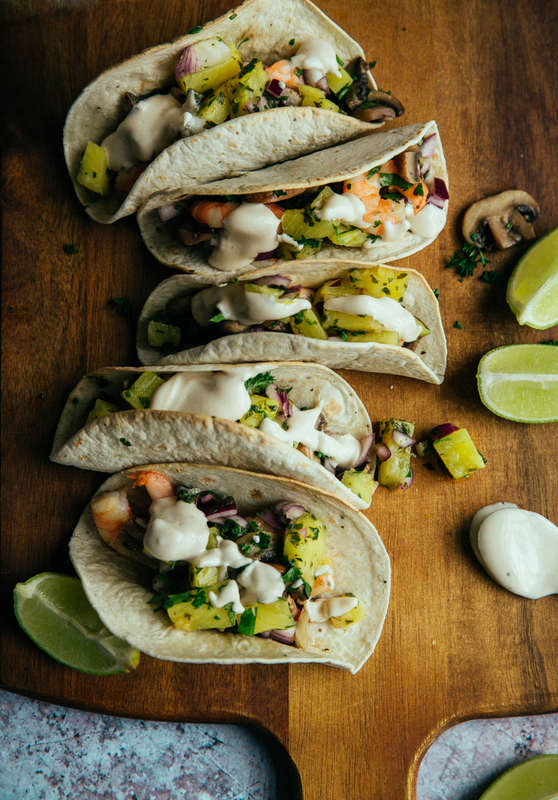 Now, I’d gladly have tacos filled with almost anything- and probably enjoy them too. They were our favourite meal while on our Cali honeymoon and even the thought of them makes me hungry and happy at the same time. These ones were a no-brainer really and came together so effortlessly and quickly. 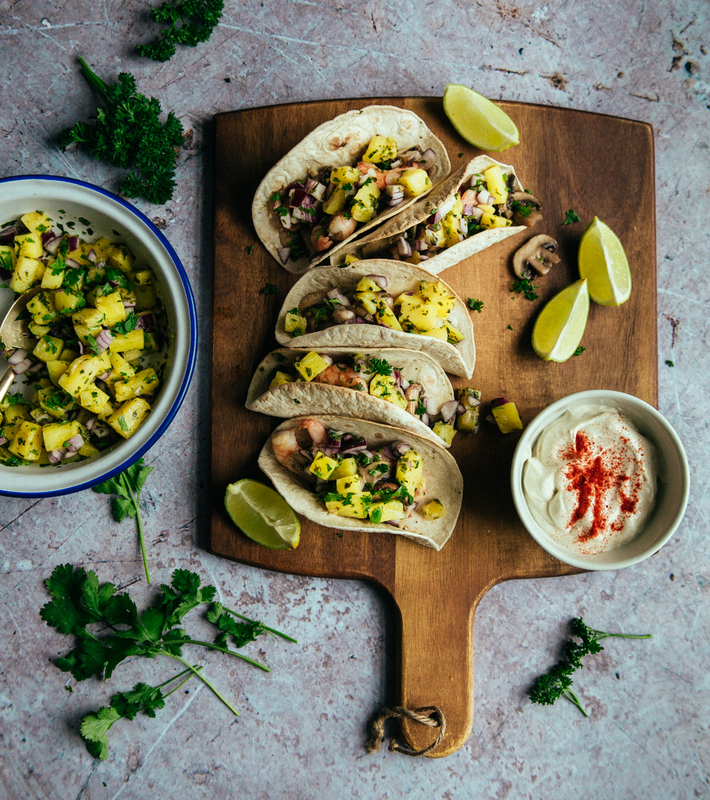 They are filled with fresh herbs, which I absolutely love, and the sweet and spicy pineapple salsa is a dream- so easy to whip up and pairing perfectly with the mushrooms and prawns, although I’ve also had it on its own simply with toast and it was a treat. I’ve made the paprika yogurt a few times before- it’s great with grilled chicken and, according to Mike, very good here too, adding one last delicious layer of freshness. 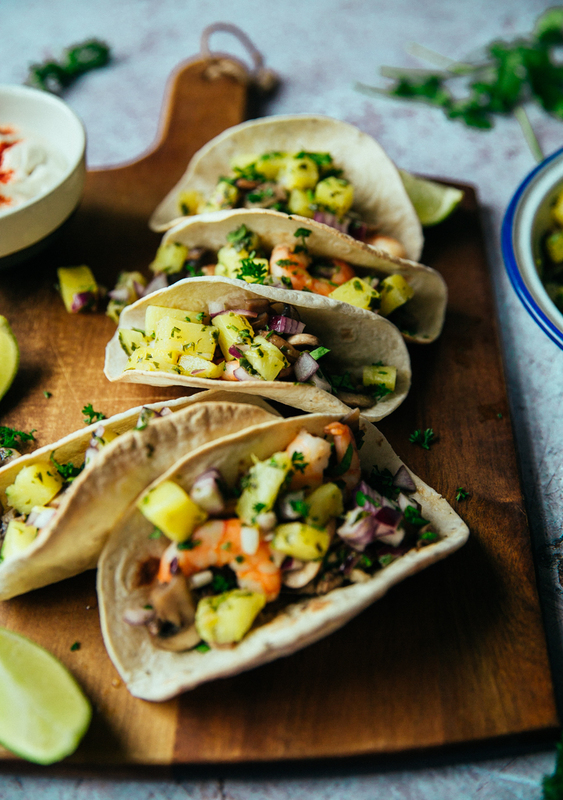 To make the salsa, toss the pineapple with the lime juice and zest and Tabasco sauce. Warm a large frying pan over medium heat and cook the pineapple until soft and sticky, about 7′. 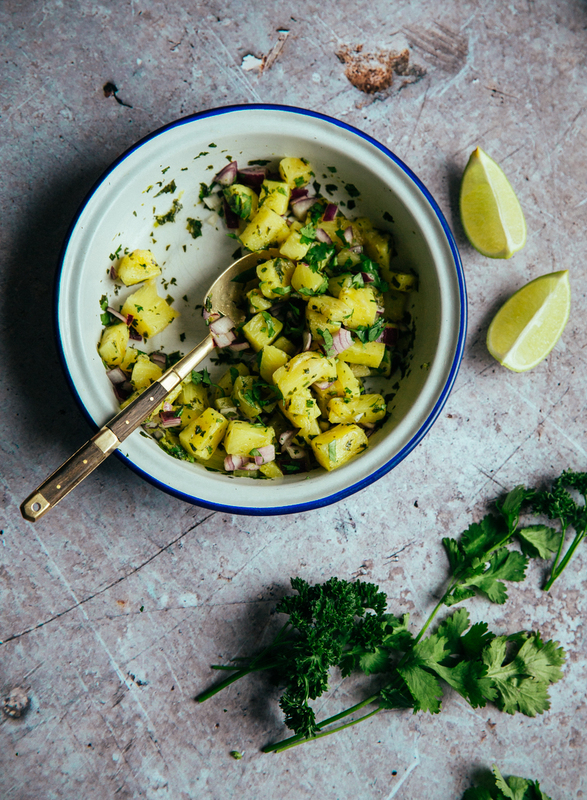 Add the fresh coriander, red onion and a good pinch of sea salt and transfer to a serving bowl. Preheat the oven to 180ºC (160ºC FAN) and lightly brush the tortillas with olive oil. Curl them and place one next to the other, with some foil between them so they don’t stick. Put in the oven for about 10′, or until golden. Wipe the pan you used for the pineapple clean and heat the olive oil over medium heat. Add the garlic and mushrooms and cook until just soft, about 5′. Add the prawns and parsley and cook for another 3′. Season with sea salt and freshly ground black pepper and remove from the heat. Remove the tortillas from the oven and fill each with a scant tablespoon of the mushroom mixture and the salsa. 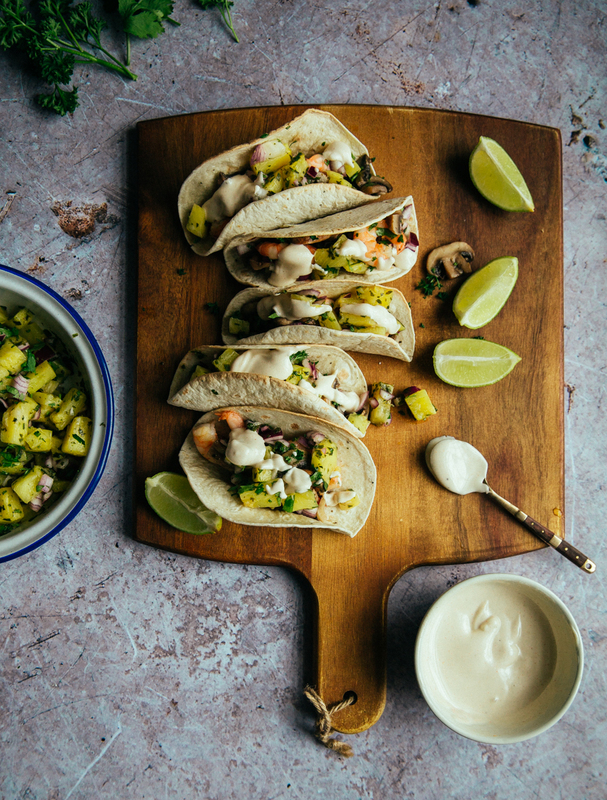 Serve each taco topped with additional fresh herbs, a good squeeze of lime and a generous drizzle of the paprika yogurt.